The Poly could well have been the first microcomputer specifically designed for educational use in the world, and it came from New Zealand. The Poly was designed by Neil Scott and Paul Bryant at Wellington Polytechnic (hence its name) in 1980 as a teaching machine for computer assisted learning. With its unique form and physical presence, the Poly was bound to attract a lot of attention. In addition to its singular design, the Poly-1 began with 64kb of memory (four times the maximum available on an Apple II), as well as incorporating a video card allowing the overlay of video and graphics — absolute cutting edge technology of the day. Perhaps its most remarkable feature though was its ability for networking. For a year or two the Poly may have been the most networkable home computer anywhere, before 3Com thought to make ethernet cards for Apple IIs. The New Zealand government’s Development Finance Corporation partnered with Progeni Computers, in Lower Hutt, to form Polycorp. The Poly-1 was manufactured by Polycorp and became available in 1981. Meanwhile the original prototype team had pitched a concept successfully to the Minister of Education, for a commitment to support the computers’ development and guarantee take-up of a certain number of Polys into NZ schools. The Education Department managed the production of computer-friendly course material for which Polycorp became the agents. Sixty teachers worked on subject specific curriculum content, that was ingested into the Poly software.The assistance that Polycorp had worked hard for, from the NZ government, fell through — with pressure on the freshly re-elected (barely!) National government to have less hands-on participation in the business world. However the main obstacle to the Poly’s take-up was its prohibitive price tag. In 1983 Apple dropped the price of the Apple II for schools from $4800 to $1200, and although Polycorp protested, prompting Customs to force Apple to raise their price again to $2020, the Poly was left a long way from the market price, at $8090. Several thousand Poly’s were sold in NZ and a contract shipment of Polys was sold to the Australian Army. Polycorp wound up around 1990, following a bit of a promising foray into the Chinese market in the late 80’s. 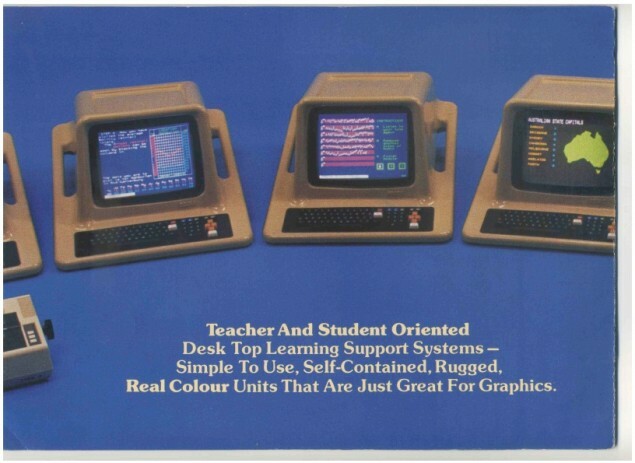 Interestingly a couple of early promos that were made for the education sector reveal that the Poly came loaded with its own games — which were sweeteners for the diligent students who were able to complete course selections on the computer. We’d be very interested to hear more about these games from anyone who may have played them in school. Were they strictly “educational games”? Did they have different levels? Feel free to share any Poly-related stories or information. My name is Rene Astle and I’m an Optimist Revivalist. As an Optimist Revivalist, I never ever intend to give up hope at all. I have lots of great goals and ambitions in my mind. One of them is to revive old school technology and bring them back into the mainstream permanently. Another is building a New School Technology Hotel and Museum built inside a 1960s style building. Anybody who donates their new school technology will be paid at a total of $50 each. I hope you like my wonderful ideas as much as I do, because I have the same fascination with the 1980s like you do. Write back soon. Anyway, I am quite impressed with the Poly Computer. It will also be one of the retro computers that will be brought back into the mainstream as well.